Text description provided by the architects. 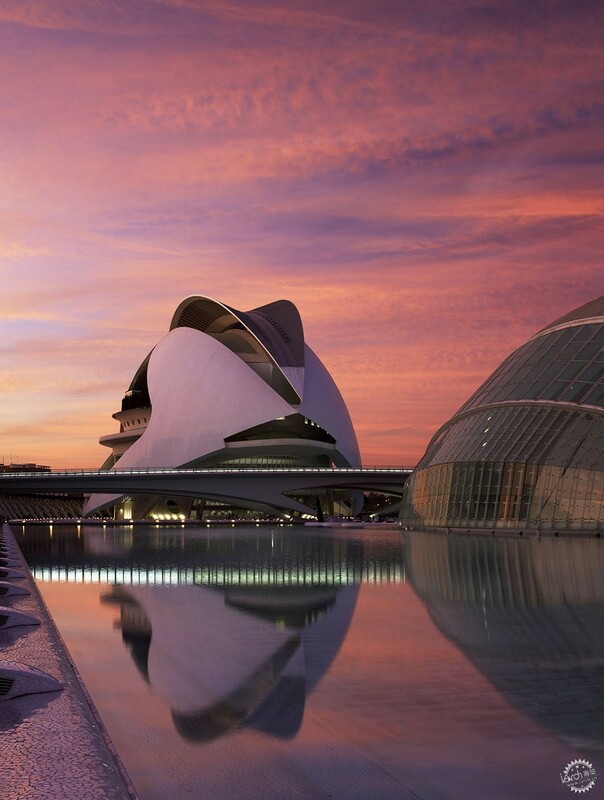 The Valencia Opera House is meant to serve as both a major performing arts facility for Valencia and as a dynamic urban landmark, helping to consolidate and animate the area in which it is built. 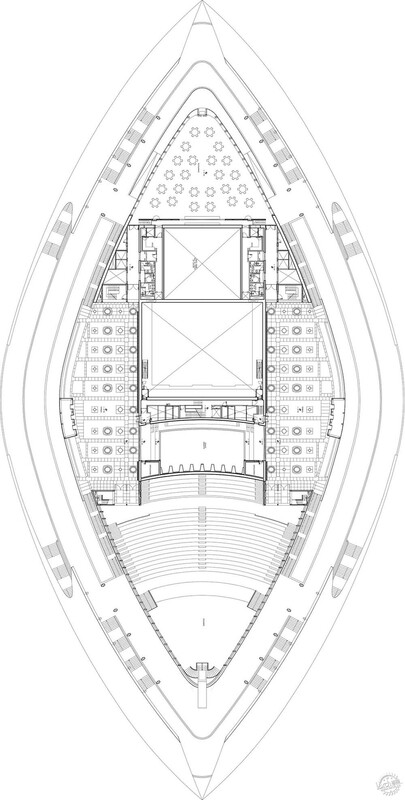 The main components of its program are an auditorium seating 1,706, suitable for opera productions as well as concerts and ballet; a 380-seat chamber music hall for ensemble performances, drama and other events (lectures, meetings, etc. 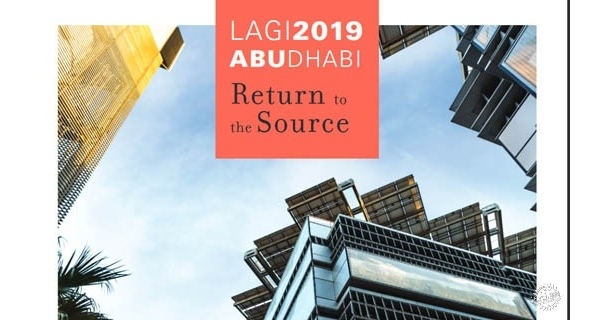 ); and an auditorium seating up to 1,520 people, equipped with advanced film and video projection systems, offering the possibility of viewing performances on special video screens. 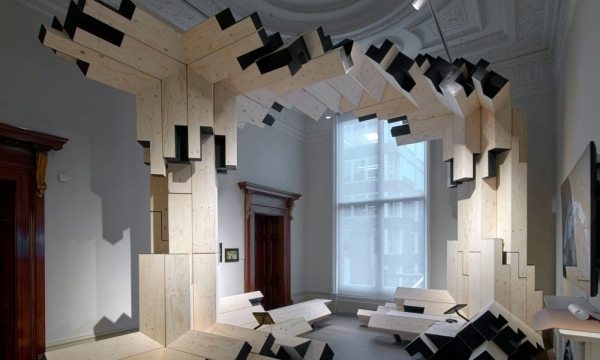 Located adjacent to the main building is a 400-seat auditorium for experimental theater and dance, with gallery space for exhibitions of fine arts and decorative arts. 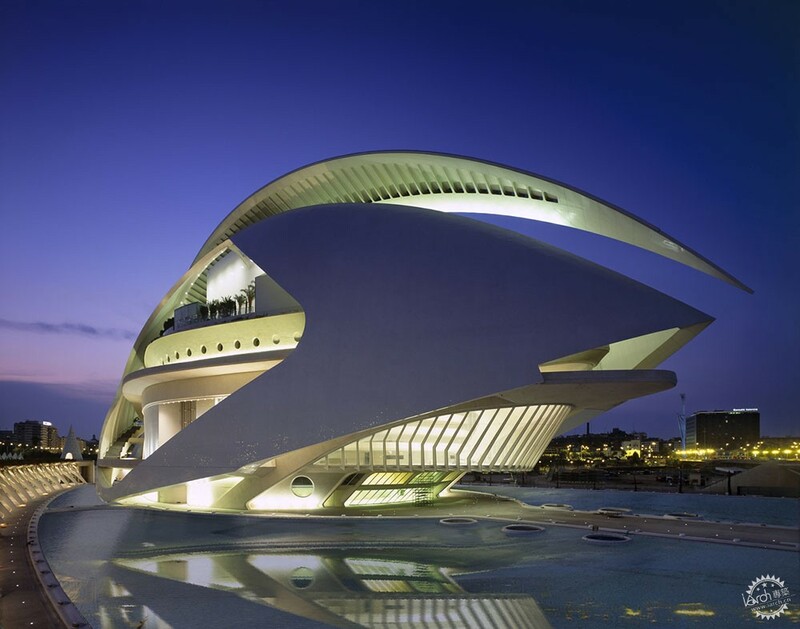 The Valencia Opera House is conceived as the final element in the City of Arts and Sciences complex, designed by Santiago Calatrava on an 86-acre site along the dry bed of the Turia River. 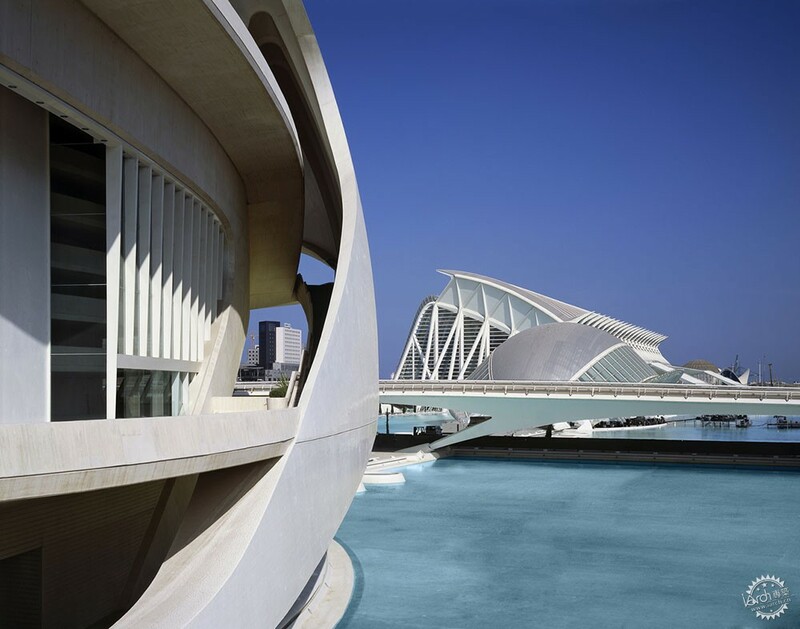 Situated midway between the old city and the coastal district of Nazaret, the complex is intended by the Generalitat Valenciana to bring new focus to an incoherent and under- developed area of Valencia and to link the center city with the sea. 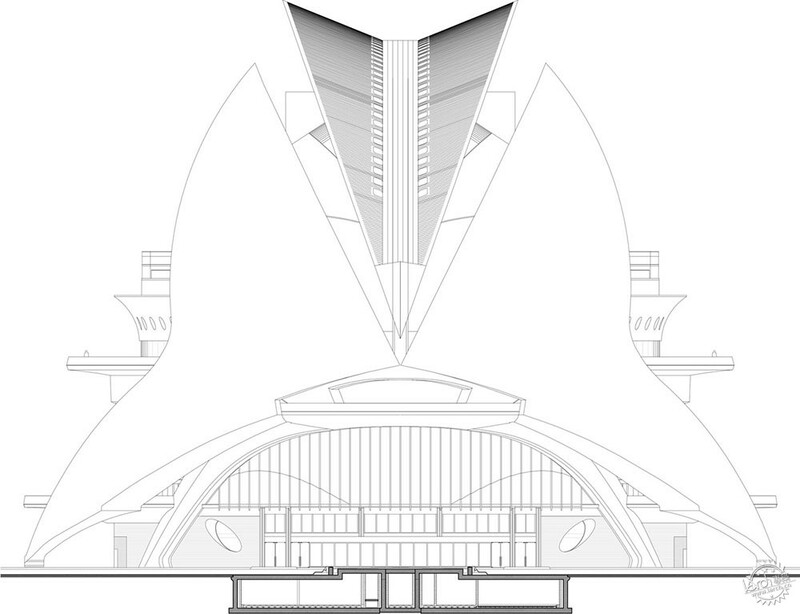 The Opera House is one of three buildings that form an integrated, linear progression: from the Opera House at the western end of the site, to the Planetarium/IMAX Theater (Hemispheric Theater), to the Príncipe Felipe Science Museum at the eastern end. 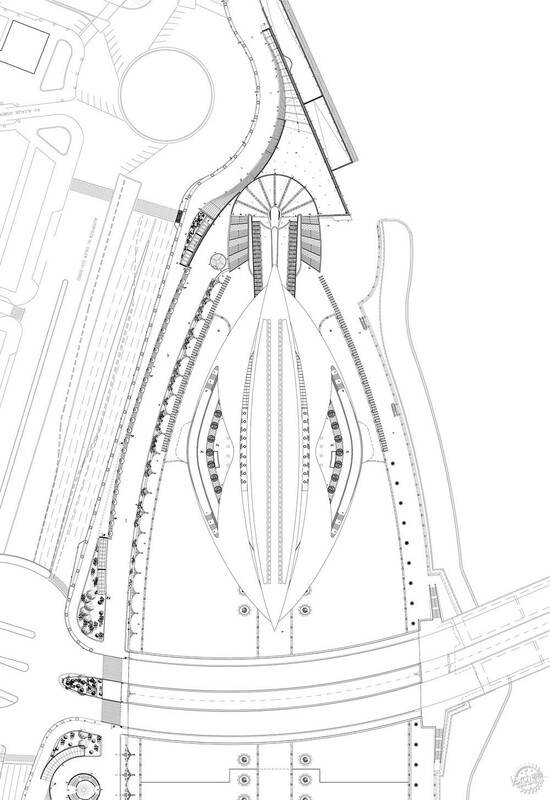 Another structure, known as L’Umbracle, is a promenade and parking garage, built within an open arcade that is a contemporary reinvention of the winter garden. 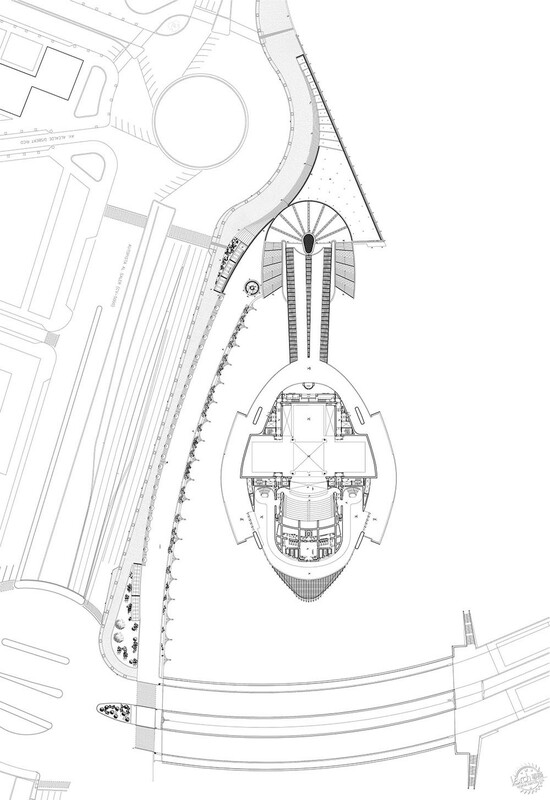 Linking the structures are extensive gardens and bodies of water. 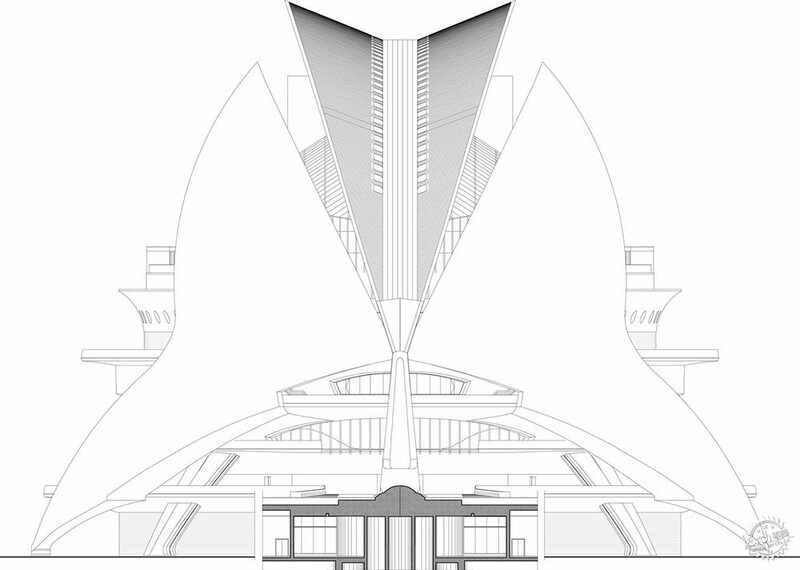 In recognition of the civic importance of the Opera House, Calatrava gave the building the iconographic character of a monumental sculpture. 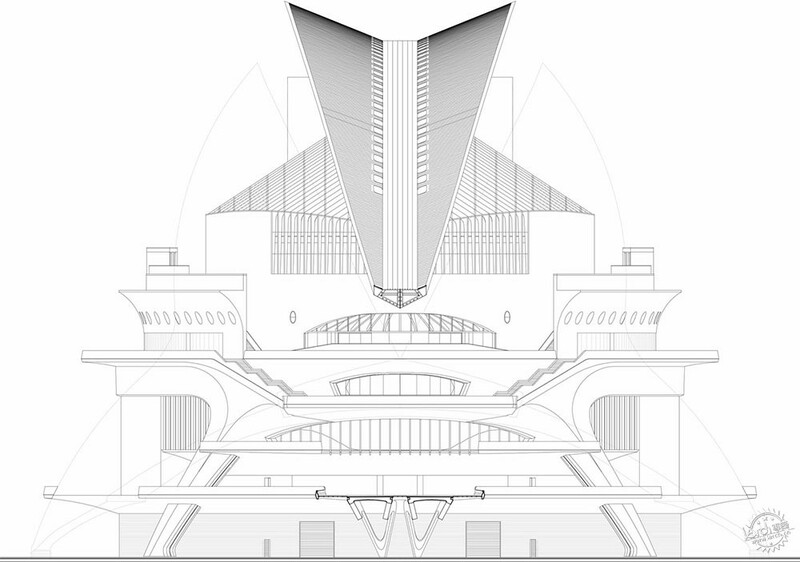 In form, the building is a series of apparently random volumes, which become unified through their enclosure within two symmetrical, cut-away concrete shells. 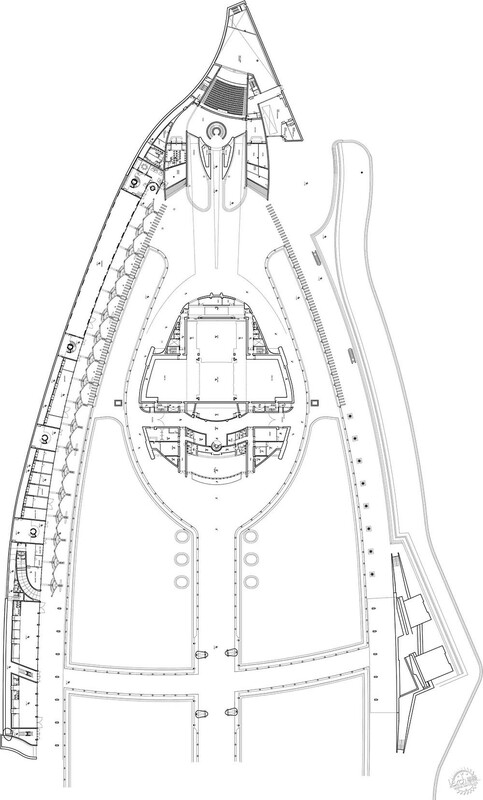 These forms are crowned by a sweeping steel sheath, which projects axially from the entrance concourse out over the uppermost contours of the curvilinear envelope. 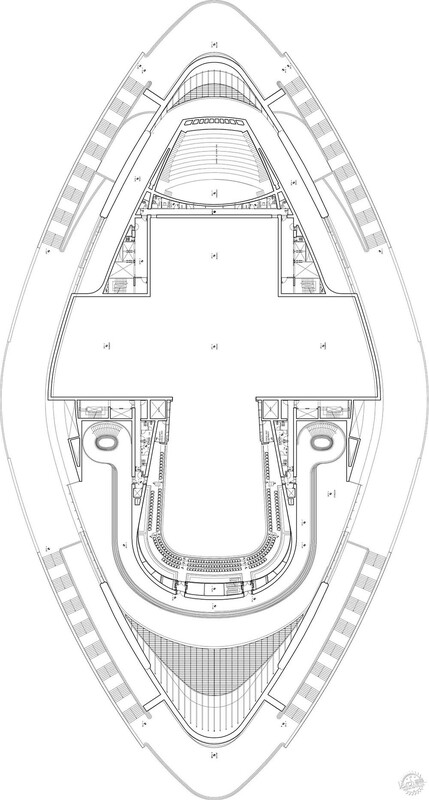 The structure that results defines the identity of the Opera House, dramatically enhancing its symbolic and dynamic effect within the landscape, while offering protection to the terraces and facilities beneath. 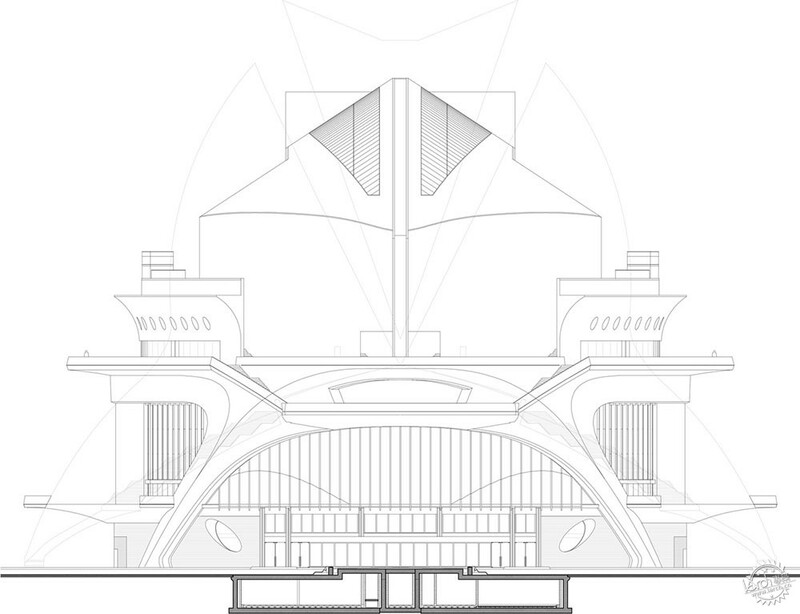 The different volumes of the building are stacked between horizontal promenade decks, which cantilever off the side of the structure. 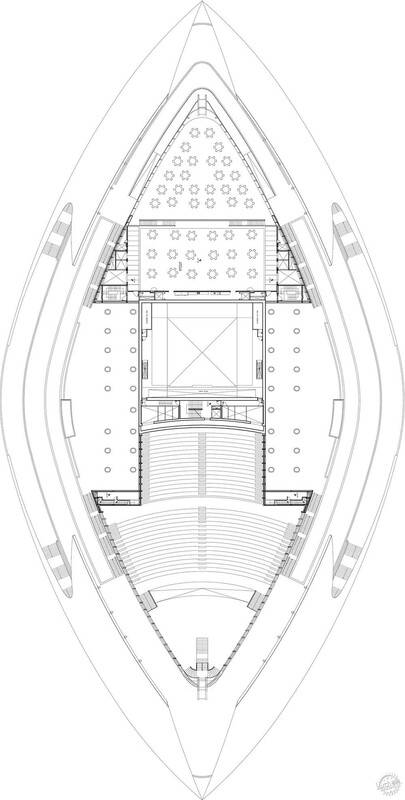 The central core is occupied by the fully air- conditioned auditorium of the main auditorium, which is set within an acoustically shaped shell embedded within the cluster. 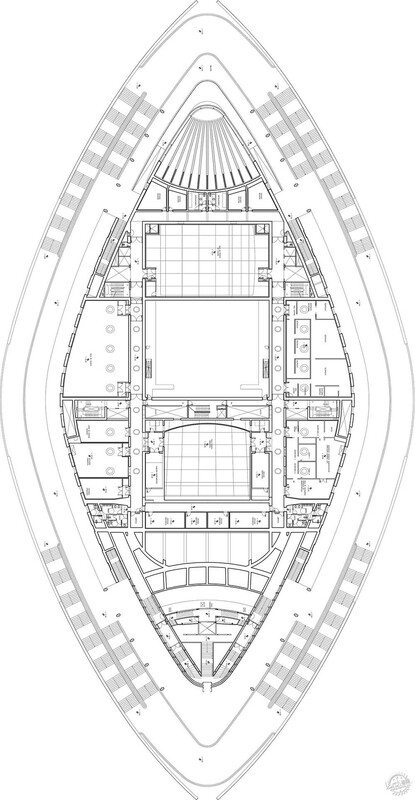 Also housed in the central core are the scenery module and lifting mechanisms for the main auditorium, whose stage measures 5,166 square feet. 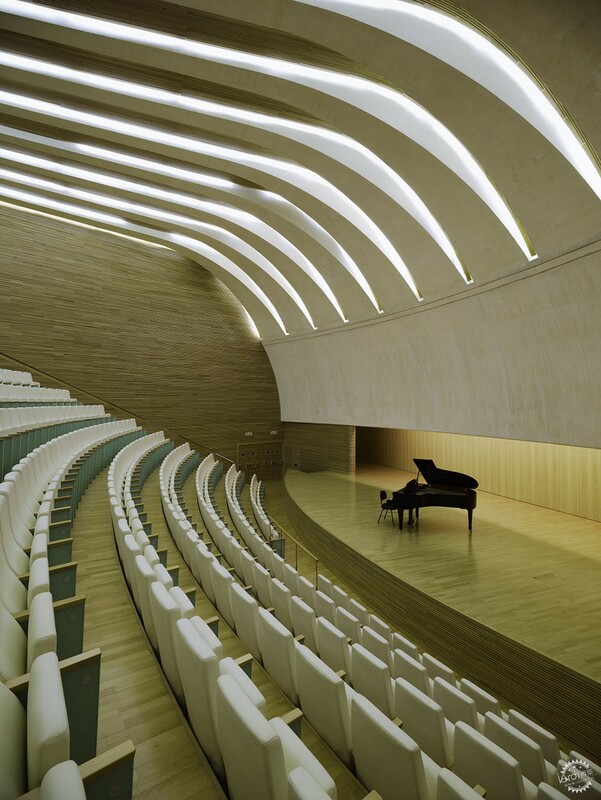 For the open performance areas, the roof and defining walls enclosing the complex have an acoustical function, while a glass-covered, insulated rehearsal area is provided above the chamber music hall. 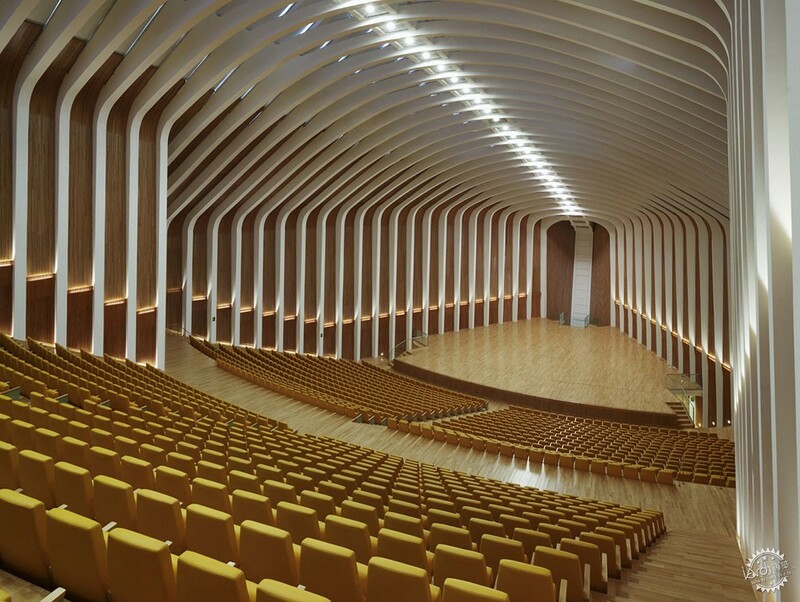 The shell surrounding the building permits peripheral exterior circulation to the different auditoriums, garden terraces, cafeterias and restaurant. 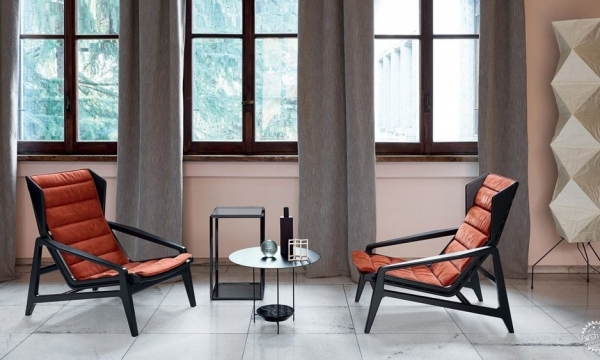 These areas are linked by promenade balconies, stairs and exterior elevators, offering beautiful views of the city and the gardens. 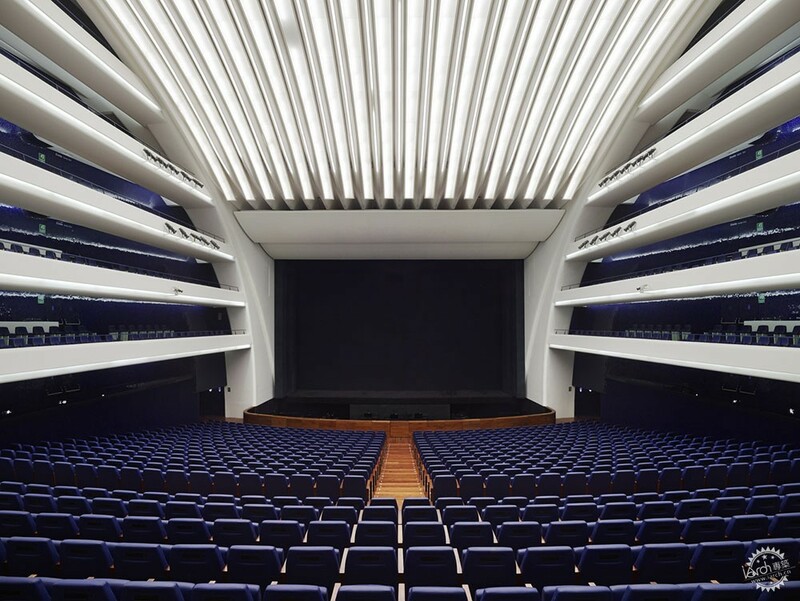 Because a ticket is required only upon entering an auditorium, the public may move freely throughout the building, giving the Opera House a welcoming character as a gathering place, and making music more accessible to the people. 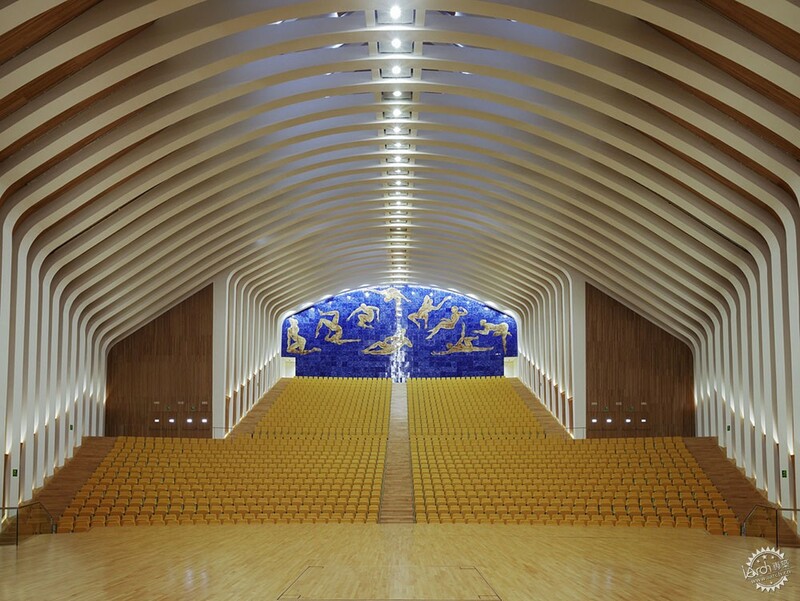 Calatrava has also designed permanent art installations for major spaces within the building, including two large murals and two large bas relief sculptures in ceramic. 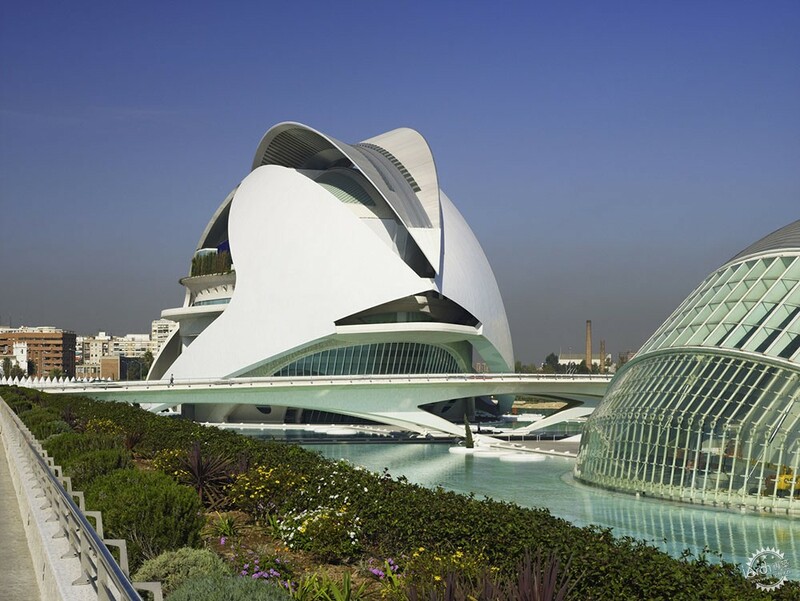 客户：Generalitat Valenciana and Ciudad de las Artes y las Ciencias S.A. 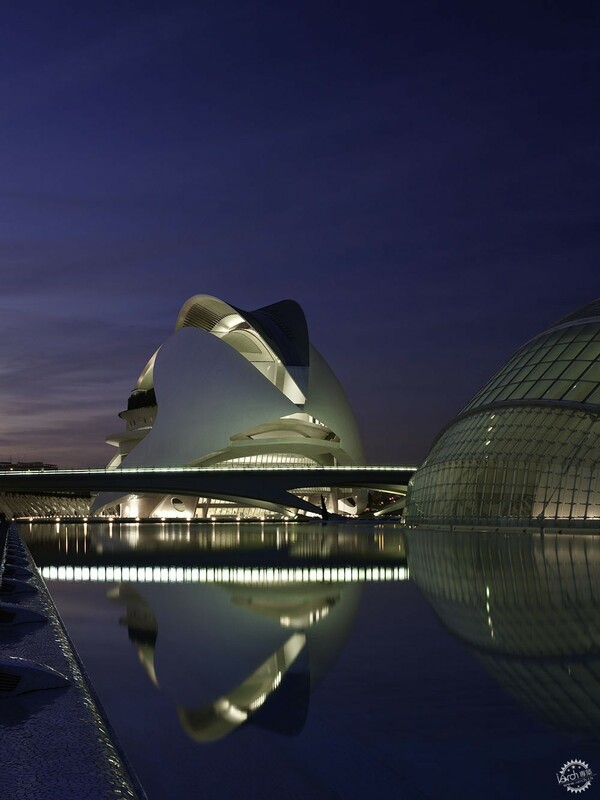 Client: Generalitat Valenciana and Ciudad de las Artes y las Ciencias S.A.